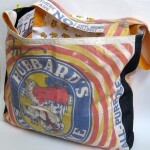 Hubbard’s Sunshine Reversible Market Bag | w3bCh1ck! I LOVE every Hubbard’s Sunshine bag I’ve come across, the colors are eye popping and the graphics superb. This one features the whole darn barnyard on the front & was in pretty good shape, no stains at all. 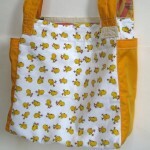 The sides & bottom of the bag are done in a dark blue denim, the lining is a super-soft white flannel with a yellow baby chick print. There are two bright yellow side pockets on the inside large enough for water bottles. The bag is completely reversible and a great size for an all around tote bag.